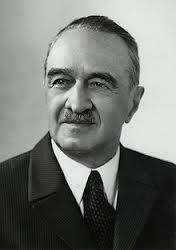 Anastas Mikoyan was born in Sanahin, in November 25, 1895. Member of the Central Committee of the Soviet Communist Party from 1922 Anastas passes through the Stalinist purges and after a period of disgrace, he held very high office until 1965. His most important role was his decisive action at the time of the Cuban missile crisis in 1962. He obtained security guarantees for the Cuban regime by the Americans, dismantled the missile program which held the Cubans while maintaining as allies of the USSR. He operated a strategic retreat of the Soviet project without losing face. His diplomatic skills allowed him to sit on the Politburo under Stalin and his successors. He died in Moscow on 21 October 1978. Artem Ivanovich Mikoyan (August 5, 1905 in Sanahin – December 9, 1970) is a Soviet aircraft designer partnership with Mikhail Gurevich, forming the MiG design office. He entered the Air Force Academy Zhukovsky graduating in 1937. Then he was appointed head of the new engineering office in Moscow in December 1939. With Mikhail Gurevich, he created an office to design a series of hunters. The MiG-9 in the immediate post war I-270 prototype became the MiG-15 with 15 000 copies were built then the Mig 21 aircraft was used during the Korean War. Artem continued to produce high-performance fighters during the years 1950 and 1960. He was twice the highest civic honor (Hero of Socialist Labor), and was six times deputy of the Supreme Soviet. Posted on jeudi, juillet 31st, 2014 at 9 h 57 min.